High-quality products that you can hear coming. 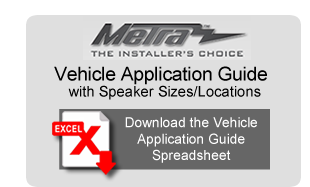 As the "Installer's Choice" for aftermarket car audio installation accessories, our team at Metra strives to not only satisfy but also astonish our customers. That's why at Metra, our brands offer the best in dash kits and installation products and accessories, including our own Metra Turbokits, Turbowires, and Antennaworks, plus all the Metra parts that keep you sounding great!